Ryanair, Europe’s No. 1 airline, today (28 Feb) launched its 2017 Liverpool winter schedule, with 2 new routes to Copenhagen and Milan, a new winter service to Prague and 24 routes in total, which will help deliver 2m customers p.a. and support 1,500* jobs at Liverpool John Lennon Airport, as Ryanair grows its Liverpool traffic by 11%. 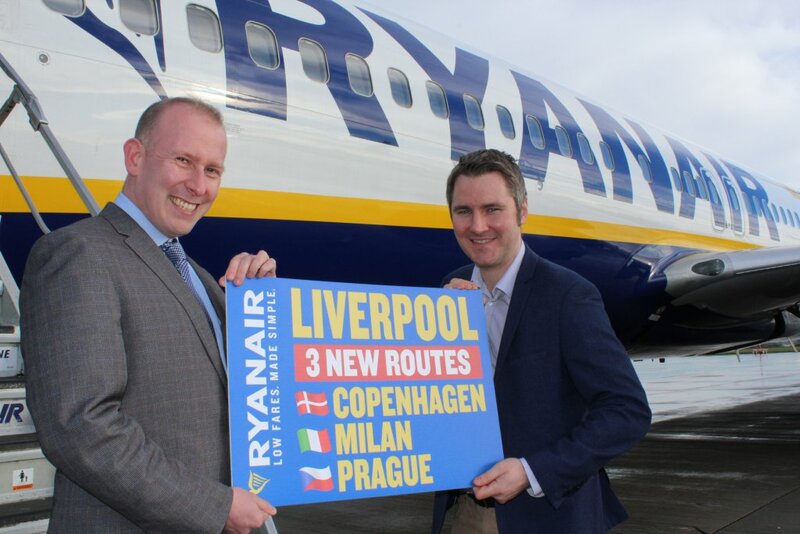 Ryanair will continue to connect Liverpool with major European cities on high frequency, low fare services including Barcelona (4 wkly), Milan (3 wkly) and Dublin (4 daily), as well as offering a wide range of winter sun routes, on the lowest fares, making Ryanair the ideal choice for business and leisure customers. Ryanair’s Liverpool summer 2017 schedule is attracting record bookings, with more frequencies to sun destinations for summer family holidays, including 3 new routes to Bari (2 wkly), Girona (2 wkly) and Prague (4 wkly) which commence in March, and an even better customer experience, as Ryanair continues to roll out its “Always Getting Better” improvements. “We are pleased to launch our Liverpool winter 2017 schedule, which includes 2 brand new routes to Copenhagen and Milan, the continuation of our new Prague route into winter, and 24 routes in total, which will deliver 2m annualcustomers at Liverpool John Lennon Airport. These new routes will go on sale on the Ryanair.com website later this week as we continue to grow our Liverpool traffic, tourism and jobs, underlining our commitment to LJLA and the Liverpool region.